Manuel Le Saux - Extrema Radio 468 (2016-09-28) » KaZachya.net: Информационно-развлекательный портал. Living in Rome, and championing the sound of full-on euphoric trance across Europe, Manuel has become known for uplifting peaktime trance, and his vast list of productions and remixes speak for itself. Known by his fans to play trance that no other DJs are playing has given Manuel a recognizable identity of his own. 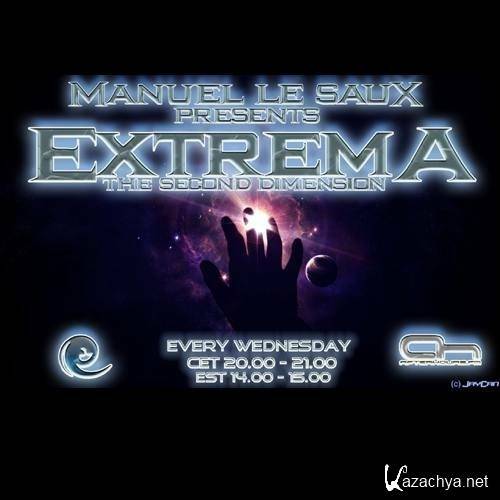 With releases on Recoverwold, Discover, A State Of Trance, Extrema Global Music, Enhanced , and Digital Society Recordings, it’s evident that Le Saux’s Extrema radioshow on afterhours.fm is one of the most listened to trance shows online. Further afield, Manny has graced the crowds of USA, Australia, Belgium, Germany, Norway, Sweden, UK, Ireland, Poland, the Cech. Republic, Spain, Turkey, Finland, Switzerland, Slovenia, Mexico and Argentina… the legacy of a great talent. Underground Anthems 2 on Recoverwolrd was Mixmag’s ‘compilation of the month’ in June 2009, and with an excellent mix of top-shelf trance, quite rightly so. 2013 he released his album “First Light” on Discover which was a great succes and he opened his own label “EXTREMA” from his famous radioshow.